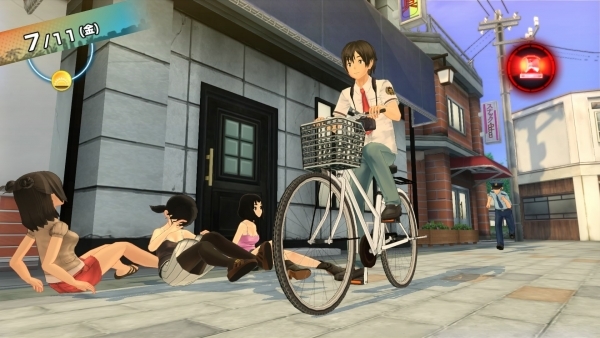 D3 Publisher has detailed the gameplay flow and various systems of Natsuiro High School: Seishun Hakusho, its upcoming open-world, photo-taking adventure game for PlayStation 4 and PS3. On weekdays, players are free to roam around after school once classes are over. On days off, players can get started earlier in the day, giving them more time to roam around. Some events can result in being able to do things after sunset, as well. Players don’t have to wait until sundown for a day to end, though. They can manually end it themselves. Time flows automatically as players go about their business, requiring planning and foresight. Once a day is over, players return to their house. At home, players can check their email with their smartphone. Doing so is often key to triggering events in the game. Players can also respond to parts of messages they get, although they have to do so within the day the email is received. Once players are done checking their email, that ends the day for real and gameplay moves onto the next one. Before going to sleep, players can sift through the photos that they took that day. Players can save photos that they like, though doing so takes up extra save space. Any photos not saved are obviously deleted automatically. Photo saving can also be down via a computer in the journalism club room. The day changes over once players are finished organizing their photos. The in-game smartphone features a calendar. On days that feature icons of the game’s heroines, that means that there are events that will be triggered then involving those girls. On weekdays, gameplay can only commence on the school grounds. During days off, though, players can also choose to start off at the local train station. Players can also opt to simply skip the day entirely and spend it entirely at home, should they wish to do so. Photography: Outside of on-going events, players can enter photography mode at any time and at any location. Up to 100 photos can be taken over the course of a day. Accelerated Action Mode (AAM): If players jump or slide with their camera already out or take out their camera while doing such actions, the game will enter slow motion. Prime Photo Ops: A good photography doesn’t just spend their days solely taking pictures of pretty girls incessantly. There are lots of other subjects worth capturing around the island as the player’s first step to becoming a respectable photographer. Standard Conversations: Players can deepen their relationship with students and various other residents of the island by seeking them out and talking to them. Doing so is accomplished by walking up to them; if a talk command appears, that means they have something to say. Keyword Conversations: Sometimes, players will have a “Keyword” option appear on screen when approaching NPCs as well. Here, players can choose a specific topic to discuss, with more keywords being added or subtracted depending on a player’s antics, as well as the overall time frame of the game. Most keywords are added as a result of taking on specific quests, but others are time dependent and the opportunity to learn them can disappear if the player isn’t vigilant enough. Exclamation Marks: NPCs with exclamation marks over their heads have something they need to ask of the player. Accepting them results in starting up a quest and successfully completing them nets things like increased affection and a higher reputation. Some quests are also necessary in order to make in-roads with the game’s heroines. Myriad Quest Specifics: Yumegashima is home to over 150 quest givers, each with their own share of troubles and tasks to dole out to the player. Given the volume of work, players can check what they’re currently handling at any time with an in-game list. Intentionally bumping into other people without a good reason. Arbitrarily lying on the ground either face up or down and obstructing other people from going about their business. Trying to enter places where men are off limits. Brushing up against people while bicycling. Riding a bicycle inside a building without permission. Trying to take photos from low angles without permission. The suspicious person gauge appears when the player engages in unwholesome activities. Repeat offenses or continuing to engage in them will result in the gauge going up and can also go up further if there are multiple witnesses. Maxing it out on school grounds will result in a visit with a school counselor. Outside of school, once police are notified, they’ll start to pursue the player and the game will enter Escape Mode. Once the gauge shows up on screen, it won’t disappear until it hits zero. Upon ceasing any suspicious activity, the gauge will start to decrease at a set rate. That being said, if the player already has a poor reputation, that’ll negatively impact how quickly things can escalate or deescalate. If you end up getting arrested or sent to a school counselor a certain number of times, you’ll get suspended from school. When you’re suspended, you won’t be able to leave the house, and all events that happen during your suspension will be cancelled. Your first suspension will last only three days, your second five days, and from there, a more severe punishment awaits. If your suspicious person gauge is filled all the way, an escape notification will appear on screen. If the police catch up with you during an escape, you’ll be taken into custody. You’ll want to maintain a good distance from the cop, and continue running until you’re able to lose the cop and end escape mode. Even if you don’t see a policeman on the screen, as long as there is a patrol light in the upper right corner, you’re on the run. Natsuiro High School is due out on June 4 in Japan.